* You are viewing the archive for November, 2007. View the rest of the archives. This morning’s post is short – just enough to get you thinking about customer service and how to do it over the weekend. With most companies, when you call (or email) in to get help, they assign you a ticket number. Some companies call it a case number, an incident ID, etc. There are a whole bunch of names for them, but you know what they are. It is some sort of unique identification tag to keep track of your issue, what has been done, etc. However, some companies don’t do that. A company I worked with did things purely my account, not by incident. Their actual system kept track of things by ticket number, but they modified it to tie in with their account system. That way, the customer didn’t have to keep track of ticket numbers – only their one account number. The company had already given printed ID cards to everyone. The ID cards had everything the customer needed related to the company – web site address, phone numbers, account representatives, and finally, account number. The customers’ account numbers is what the company used to keep track of all customer service issues. Think about it – the average customer doesn’t have to call all that often. This is a terrific guest writer post by Jean MacDonald from SmileOnMyMac. I wrote about the company’s awesome newsletters back in October. 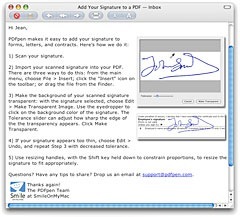 Offering a free trial to download is a standard technique in the software business. The trial may be limited in timeframe or features, but the idea is the same: get potential customers to try out the product. When they see how useful it is for them, they’ll happily purchase it. But downloading and installing software is not the same as trying it. Many people, myself included, might download something that looks interesting one day, but never make time to actually try it out. This is a gaping pothole on the road to a sale. To fill it in, we decided to try out a technique known as the “autoresponder”. I admit that I was a little skeptical about what kind of response we’d get. People are already suffering from inbox overload — would they really voluntarily sign up for more email? And some even blogged about [including here at Service Untitled] how helpful the emails were and how they demonstrated our commitment to a great customer experience. What had started out as a strategy for encouraging more purchases became recognized as a great resource for people who had already purchased. Customers love to find more uses for something they already own. The reason these emails appeal to potential buyers and current customers alike is that they are truly useful. They are not just a sales pitch. Here are some guidelines to help you write tip emails that your customers will find valuable. Find out what questions your customers are really asking. Before deciding on the topics for tip emails, it’s important to make sure that your content will be relevant. In my case, the company co-founders are also our lead developers and customer support representatives. We looked at what questions kept coming up again and again. Find out what questions they don’t know to ask. When we start planning a new version of one of our software programs, I will survey our current users. I always ask them about how often they use the various features of the software, and one of the options is “I didn’t know I could do that.” If a significant percentage of customers say they didn’t know about a certain feature, that makes it a good candidate for a tip email. Focus in on a specific topic and try to keep the length to 150-200 words. It needs to be brief enough for the user to read in less than a minute. A longer email might prompt some folks to say “I’ll read that later when I have time,” significantly reducing the chance they’ll read it at all. If a couple emails pile up without being read, not only will your customers not get the benefit of your tips, they might even unsubscribe from all your emails. Use an illustration or two, but don’t overdo it on graphics. Include a screenshot or other graphic that helps explain your tip. It is important to remember, though, that many people don’t load images into their email by default. Your tip need make sense without any illustration. We just use a small company logo in the signature of our tips. Much more than that, and your tip might be mistaken for a sales pitch. This is not what your customer signed up for, making it more likely they’ll unsubscribe or, even worse, click the “Spam” button. In a P.S., we ask users to send us their own tips, which we post on our blog. And we get ideas that help shape future tip emails! Jean MacDonald is the Marketing Director at SmileOnMyMac, a software company that develops productivity tools for Mac OS X. Before joining the company, she was the principal of Well-Tempered Web, a web design and internet marketing firm in Portland, Oregon. No isn’t the answer – even if you don’t have it. DouglasNovember 28, 2007Customer Satisfaction, Customer Service Experience, Etiquette Comments Off on No isn’t the answer – even if you don’t have it. It isn’t uncommon that I go into a store looking for something, the store doesn’t have it, and I ask if the employee knows where I can get it and they just say “no.” This shows that the employee isn’t interested in helping me as a person and probably isn’t super motivated. At Nordstrom, if they don’t have a product in their store, the sales person will often track it down from another store. I have heard of this and have had employees at Nordstrom offer to do it for me. This is a lot more than what most employees at most companies would do. I have also heard stories and read about Nordstrom employees finding products elsewhere for the customer, but I don’t have any firsthand experience with this. Why don’t more companies do this? And why don’t more employees take 10 seconds to think of another store nearby (such as in the same mall) that has the product? It is a nice thing to do, but also a good thing to do from a business perspective. I’m impressed if I see an employee at a company is working to help me. Companies should work to implement policies and procedures that encourage employees to go out of their way to help potential customers. If customers get a positive feeling about the employees of a particular company, chances are that’ll cause them to think better of the company. When customers think better of a company, it often translates into more referrals, repeat business, sales, and subsequently profits. That’s the ultimate goal and the ultimate benefit of great customer service. For more reading on this subject, check out this great post by Glen of AllBusiness Customer Service Experience. I also think it is worth mentioning that I designed the “graphic” in this post. I’m going to stick to customer service, so don’t worry. Glen pointed an interesting post out to me the other day. Glen’s point is that employees often miss the “big picture” of what a business is trying to do and the goals they’re trying to achieve. As a new jeweler, Glen was frustrated by selling the relatively inexpensive (and annoying to sell) class rings as well as cheaper gold jewelry. Everyone in the store wanted to sell diamonds, but didn’t realize it was cheaper things like the gold jewelry and class rings that got people in the door. Teenagers brought in their parents, who were far more likely to buy expensive jewelry. That’s where the money was. Another thing to keep in mind is the fact that even a small sale can generate positive word of mouth. The customer coming in to purchase the inexpensive jewelry can tell just as many people about his or her positive experience as a person who bought expensive diamond jewelry. And the potential customers that the original buyer tells about the great jewelry store? They could come in and buy diamond jewelry. So, the first sale might have been relatively small, but that can easily translate into something much bigger. Plenty of other businesses can do this. As long as you are still able to turn a profit on those less expensive products, chances are, you’ll do fine. You may not make as much money, but if you are doing a great job, you will get plenty of referrals and other business as a result of it. A lot of companies lose money on “bring them in” products, but that is a bit more risky. Be sure to treat customers buying the cheaper products just as well as you treat the other customers. If you aren’t nice to these customers, they won’t have a great experience. And if these customers aren’t having a great customer service experience, they aren’t going to come back and won’t tell their friends. Think about things you can sell or offer that can bring customers in. If you ensure that customer’s experience is a great one, there is a very good chance they will be back. I was working with a client the other day and was listening to a call. Towards the end of the call, the representative (who had done a good job) basically begged for good marks on the satisfaction survey that the company sends out after each call. He said things like “I trust you will give me good marks?” and so on. The representative for very friendly about it, but I told my client to discourage their employees to do that. As a customer service representative, you can’t hassle or push the customer to provide you with good marks. They will do it if they want to, but it is completely uncalled for to make more than a friendly reference about the survey. If you are a manager and notice representatives doing this, you should work to put a stop to it. It is terrific if employees get great marks, but they shouldn’t coerce customers to provide them. Something that is very important, though, is subtly encouraging customers to take the survey. If they don’t respond to the survey, you don’t even have to worry about how good or bad they’re rating you or your employees. There is a fine line between annoying the customer by asking too much (which can negatively impact scores anyways) and encouraging them to fill out the survey. My favorite technique for this is basically bribing people to take the survey. After them a $5 credit or a chance to win a gift card or something of that nature. It is a pretty effective method. For companies not willing to do this, you can have the representative tell the particular customer a survey will be sent to them, that it will only take a few minutes (unpaid surveys should never take more than 3-4 minutes), and that it helps the company improve its customer service. Keep it short and sweet. If this process is somewhat scripted (so the representative doesn’t overstep the thin line), it should be a nice way to tell customers about the survey and encourage them to take it. The customers that really don’t want to take the survey still won’t take it, but customers that were on the border will probably take it now. For more on surveys from Service Untitled, including sample surveys from various companies, check out this link. DouglasNovember 25, 2007Service Untitled Comments Off on Thanks HostColor! I hope everyone had a great Thanksgiving and has been enjoying their weekend. It is the time of the month where I must say a special thanks to HostColor for advertising on Service Untitled. If you are interested in hosting with HostColor (their plans start at $25 a year), just send them an email and let them know that you read Service Untitled – you’ll save 20% on your first order. Click here or their logo above for more details. If you are interested in advertising on Service Untitled, please contact us. Happy Black Friday! Today is one of the busiest shopping days of the years – sparked mainly by very nice sales on popular products by major retailers. Stores open up as early as 4 AM (!) and many customers start standing outside before that. It’s an insane shopping experience. And when there are insane customer experiences, you can predict insane customer service experiences. Look at last year to see what will happen. Have the best people working. Make it clear what people need to do. Lots of signs and explanations. All of these apply on Black Friday and similarly busy days. Customers aren’t going into stores to have a great customer service experience on Black Friday – they are going in to save money. That is their goal and everything you and your staff does that day should enable them to achieve that goal of saving money. Since you know the customers want to save money, have signs and other informational materials telling them how to do that. Point out the best sales, point out what things will not get any lower, and so on. Tell your customers how to get there and how to make it happen and they will be pretty happy. Another thing you want to focus on is customer flow. Retail design is not something I specialize in, but most retail designers try to design an efficient and productive flow for a store’s customers. Your flow will be stressed on Black Friday so you may need to use dividers, arrows, etc. to help that flow. Keep in mind that a lot of your customers will come in knowing exactly what they want. Plus, there will be competition. Because of those two factors, they won’t spend nearly as much time browsing as most of your customers do. You will likely need additional cashiers and might want to consider setting cash registers up at alternative locations. Other things that always have to be considered are security and janitorial. If your store looks like a dump by 8 AM, you’re going to have problems and turn a lot of customers off. Similarly, if things are getting stolen or people are getting hurt, it isn’t good for your business or reputation. Have plenty of managers on duty to deal with issues. And by the way, these tips don’t just apply to Black Friday. 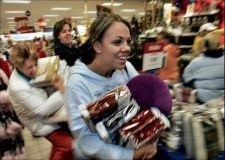 There are a lot of shopping days like Black Friday that will happen over the next month. You should do all you can to be prepared for them. Now that Black Friday is in its home stretch, try to enjoy your weekend! DouglasNovember 22, 2007Service Untitled Comments Off on Happy Thanksgiving! 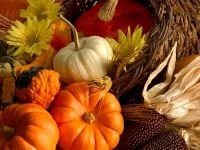 A very Happy Thanksgiving to all Service Untitled readers in the United States. For readers outside of the U.S., a very happy November 22! Take some time to give thanks, have fun with friends and family, and of course, eat turkey! There won’t be a new post on Service Untitled today, but we’ll be back tomorrow with some tips for handling Black Friday customer service.